Do obtain necessary medical treatment immediately. Do retain all records and bills. Do keep a daily journal. Do obtain names and addresses of witnesses. Do obtain traffic collision reports, if possible. Do photograph vehicle damage, scene of the accident and your injuries. Do not give a statement to anyone but your attorney. Do not sign any release or other documents without the advice of your attorney. 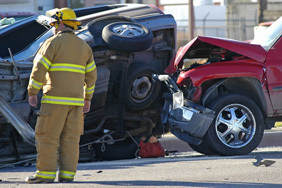 Do not discuss the accident or injuries with anyone but your attorney. This information will hopefully answer many of your most important questions so that you do not damage or lose your potential personal injury or wrongful death claim. In a serious accident, the most important evidence about how the accident happened and who is responsible must be gathered immediately! An experienced attorney knows what to do to properly investigate an accident. The insurance industry employs professional investigators to gather physical evidence, obtain witness statements, and document the facts which favor them. Even smart, sophisticated laypersons often overlook or fail to gather important evidence because they are simply not in the business of organizing their case in a way which will be most persuasive to their adversaries or to the court who may ultimately decide the issues. What follows, therefore, is advice that should help anyone avoid common mistakes. It is not, however, legal advice. Legal advice can only come from the attorney you choose to represent your interests, and who knows all of the facts and the laws which are applicable. The old adage in legal circles is that “any attorney who represents himself has a fool for a lawyer.” Such advice applies doubly so to a lay person who attempts to investigate their own personal injury case. The first thing anyone should do after being involved in an accident is to speak to an experienced trial attorney to get specific advice about their case. Typically, such advice costs nothing. If you need immediate help, either call us or use the contact form on the left, and someone will speak with you or return your call promptly. Even if you are not able to immediately reach an attorney, you should do your best to document what has occurred. In serious accidents, police reports will be prepared, which is usually a basic record of what occurred in the accident, who was involved, as well as the identities of some of the witnesses. It is always helpful to make a written record of the names, addresses and phone numbers of any possible witnesses to your accident. Follow your doctor’s advice. If you do not believe that your doctor’s advice is helping you, do not simply give up. Go see another physician with whom you are more comfortable. But do not reject your doctor’s advice without a back-up plan. The health care bureaucracy is often unwieldy, and we often must be extremely persistent to get the health care we need. But if you simply stop “treating”, it could delay your improvement. It could also damage your personal injury claim. Do not hesitate to get medical care. Even if you have been seriously injured, insurance companies will not believe you unless a hospital or your doctors have seen you and made a record of it. Do not hesitate to explain to your medical providers the full nature and extent of your injuries. Obviously, when you see a medical provider, you are interested in obtaining the best medical care possible. Consequently, tell the doctor the complete truth of your symptoms. Take photographs of everything. Photographs of the accident scene, the vehicles that were involved, the products that were involved, and your injuries– all are important, irreplaceable pieces of evidence which can enhance your case greatly. Use 35mm or digital cameras. Do not use instamatic cameras, which are greatly inferior. It is also important to know what aspects of an accident (skid marks, sign posts, warning signs, lights, viewpoints, etc.) to photograph, or what portions of the automobile or product to film. Again, these are aspects of your case that an experienced attorney representing you will know to have his or her investigator photograph and document, which is another advantage to retaining an experienced attorney as soon as possible. In auto accidents, wrecked vehicles are towed and shortly thereafter destroyed or “salvaged.” In any serious auto accident, it is important for trained investigators, accident reconstructionists and other experts to be able to inspect the vehicles before they are lost. Consequently, if you have been involved in a serious accident, do not allow your wrecked vehicle to be destroyed, salvaged or otherwise given away to a third party. If you have a potential product liability case, it is extremely important that the wrecked vehicle be preserved throughout the litigation. Where serious injuries have occurred because a vehicle has rolled over, the roof been crushed, seats collapsed, restraint systems failed to operate, tires blown out, fire occurred, or any of the myriad problems which can occur, the vehicle involved must be purchased and preserved. While it can be expensive to purchase and store a wrecked vehicle, it is an indispensable investment in a products liability case against the responsible company which designed or manufactured a defective vehicle. How much time do I have to take legal action? Every state has statutes of limitations and procedural requirements which prevent you from pursuing your personal injury or wrongful death claim after a certain time period. This time period varies from state to state, and in some states is very short. In California, personal injury and wrongful death cases have a two year statute of limitations. However, the question of when the statute of limitations begins to run and when it ceases is subject to many exceptions and limitations. An experienced trial attorney should be consulted about these issues. For example, in California if an injury or death is caused by a governmental entity, which includes not only a city, county or state, but many quasi-governmental entities which a layperson may not identify as a “governmental entity,” a written claim must be filed with the appropriate person within six months of the injury or death. A lawsuit must thereafter be filed within six months of the rejection of the claim. Significantly, while most children who are injured have until they reach age 20 to file their personal injury actions, if the culpable party is a public entity,the child’s guardians must still make the appropriate claim within six months. As noted above, all of the statutes of limitations have exceptions. (Please see, for example, the statute of limitation in child sexual abuse cases under CCP §340.i.) Consequently, it is once again important that you obtain experienced legal advice from an attorney who knows the facts of your case and the law of a particular state. Should I speak with the insurance company investigators? No matter how nice an insurance claims representative or investigator seems, he or she is in the business of gathering facts which will support the insurance company’s position that it owes you little or no consideration. Insurance company claims adjusters and investigators are trained professionals, who take witness statements every day of their working lives. They know what is important, they know what questions to ask, and they know how to create a “record” which will most persuasively minimize your right to compensation for your injuries. This does not mean you should not report your accident to your own insurance company – you should. Typically, such a report is made to your insurance agent. However, when an insurance claims representative, adjuster or investigator calls and is interested in obtaining your “statement,” you should politely decline. Instead, you should refer that claims person to your attorney who can then represent your interests. As you have probably gathered by now, if you have been wrongfully injured, it is always in your interests to obtain the advice of an experienced attorney quickly. This does not mean, however, that you ultimately have to hire a lawyer and pay him or her a percentage of your ultimate recovery. If your injuries are indeed minor in nature, it may be in your interest to attempt to negotiate with the insurance company on your own. However, the informed advice from an experienced, ethical attorney will help you make the decision about whether to handle your case on your own. If your injuries are significant, however, it is virtually never in your financial interest to attempt to represent yourself. Research indicates that competent, experienced attorneys significantly increase the likelihood and amount of success achieved by individuals who have suffered personal injuries. Additionally, the more serious your accident and injury, the more complicated the medical, financial and legal issues will typically be. It behooves you, then, to hire the right attorney. With attorneys, as in life, there is no substitute for experience. Lawyers who are experienced develop reputations. By speaking with friends or family you may have who work in the legal system, you can find out about the reputations of attorneys you are considering. If you have a personal injury or wrongful death case, you want a lawyer who specializes in those types of cases. Perhaps the most valuable resource for identifying those lawyers with the best reputations is a publication called Martindale-Hubbell, which is available on the internet and in law libraries. You should only hire an attorney with an “AV” rating by Martindale-Hubbell, and who specializes in personal injury law. The “AV” rating is the highest given by Martindale-Hubbell, and it is a rating which is based on a survey of the attorneys who practice with and against the lawyer being rated, as well as the judges who know that attorney. Consequently, it is a rating which is established by an attorney’s peers and is therefore a “baseline” in deciding whether to hire a particular attorney. Most personal injury attorneys work on a contingency fee. In a typical case, attorneys charge one-third to settle your case, or forty percent if the case is taken to trial. If there is no recovery, there is no fee. In more complicated or difficult cases, the contingency fee may be a higher percentage. In medical malpractice cases, the contingency fees are capped in California by statute. In cases involving minors who have been injured, the contingency fee is typically twenty-five percent of any recovery. There are always costs of prosecuting a case, which are separate from the attorneys fees. These costs typically involve money that your lawyer will pay to third parties in order to prosecute your case. These “costs” can be significant. For example, expert witnesses such as physicians, accident re-constructionists, bio-mechanists, economists, life care planners and others, sometimes charge as much as a $1,000.00 an hour for their time. Consequently, an important part of any fee arrangement with your attorney will be who advances those costs of suit. Most of the time, an experienced attorney will advance those costs of suit. In sum, lawyers do not all charge the same, even in their contingency fee agreements with clients. It is important for you to inquire at the outset regarding the nature of the contingency fee relationship so that you completely understand it. However, if you hire an experienced, ethical lawyer to prosecute your serious personal injury or wrongful death action, it will normally be an investment which was well worth the effort and expense.